Convection ovens can make cakes fluffier and slightly larger, and can bake several cakes at once. They also ensure that cakes are evenly baked, regardless of their position in the oven. However, if you don't know how to properly use a convection oven, the results can be disastrous. 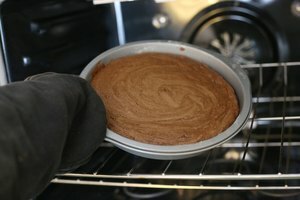 Using it like a regular oven results in hard, overcooked cakes. Adjusting the cooking temperature and arranging pans properly helps achieve perfect results every time. Preheat the convection oven. Reduce the baking temperature on the recipe by 25 degrees Fahrenheit. 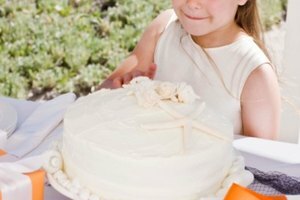 If the cake is very large, reduce the temperature an additional 5 to 10 degrees. Pour the prepared cake batter into the cake pan. Once the oven is preheated, place the pan in the oven. 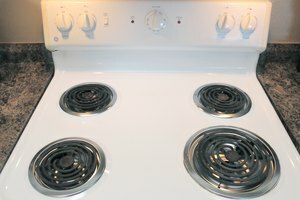 Leave at least two inches on all sides between multiple pans so the air can circulate properly. Do not cover cakes with tinfoil. Leave the oven door closed while the cake bakes. Convection ovens circulate hot air around the food, so opening the door releases a lot of heat. 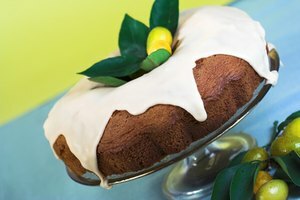 Check the cake for doneness about 10 minutes before the recipe suggests. Smaller cakes bake faster in a convection oven, while larger cakes may take longer than in a conventional oven. Remove the cake from the oven when a toothpick inserted in the center of the cake comes out clean. Let the cake cool slightly before removing it from the pan. Stand away from the oven when you open the door. Hot air will blow out of the oven when the door is opened and can be painful to exposed skin. It's safe to stand in front of the oven after the door has been open for one or two seconds.